2 Look at the examples given. 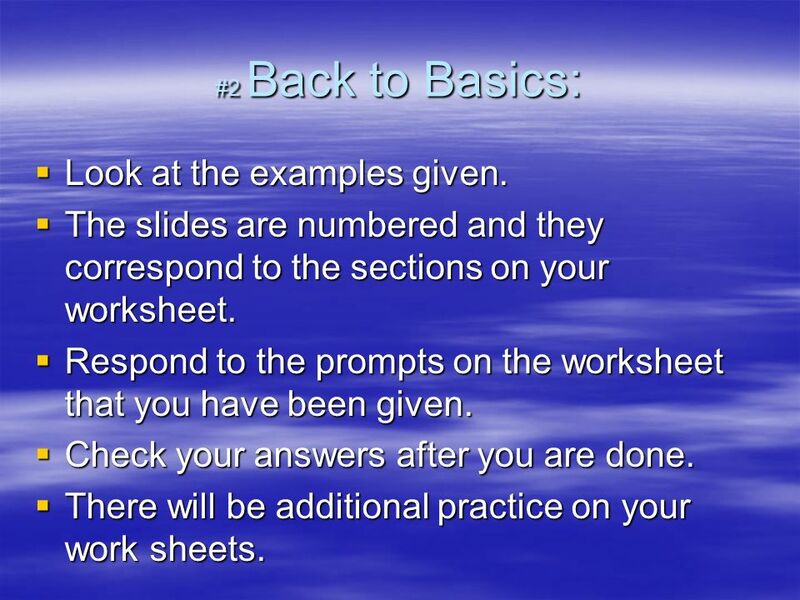 #2 Back to Basics: Look at the examples given. The slides are numbered and they correspond to the sections on your worksheet. Respond to the prompts on the worksheet that you have been given. Check your answers after you are done. There will be additional practice on your work sheets. #3 Gustarse Me gusta hablar español. I like to speak Spanish. Write “I like to speak English.” What is the word for English? If you do not know, look it up. It is inglés. Write your answer now. Me gusta hablar inglés. 4 Try the following. Did you write….? Me gusta bailar. Me gusta dibujar. 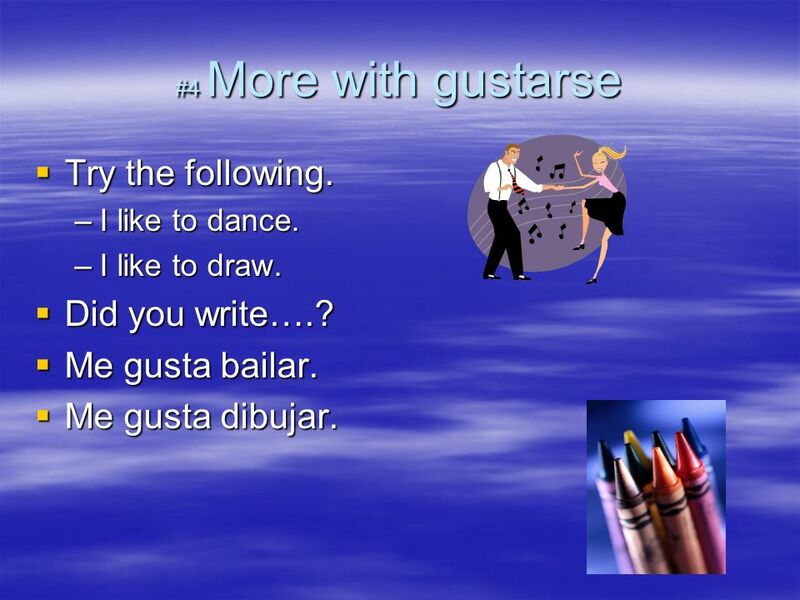 #4 More with gustarse Try the following. I like to dance. I like to draw. Did you write….? Me gusta bailar. Me gusta dibujar. When I want to ask you (tú) if you like to do something ¿Te gusta practicar deportes? How would you ask, Do you like to run? Write your answer... ¿Te gusta correr? 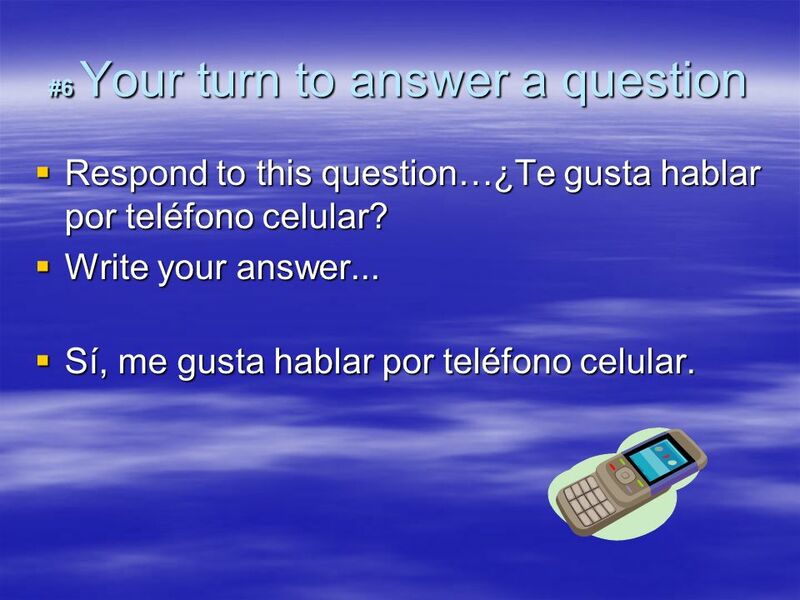 Respond to this question…¿Te gusta hablar por teléfono celular? Write your answer... Sí, me gusta hablar por teléfono celular. 7 When you say you like or dislike something, gustarse may change. 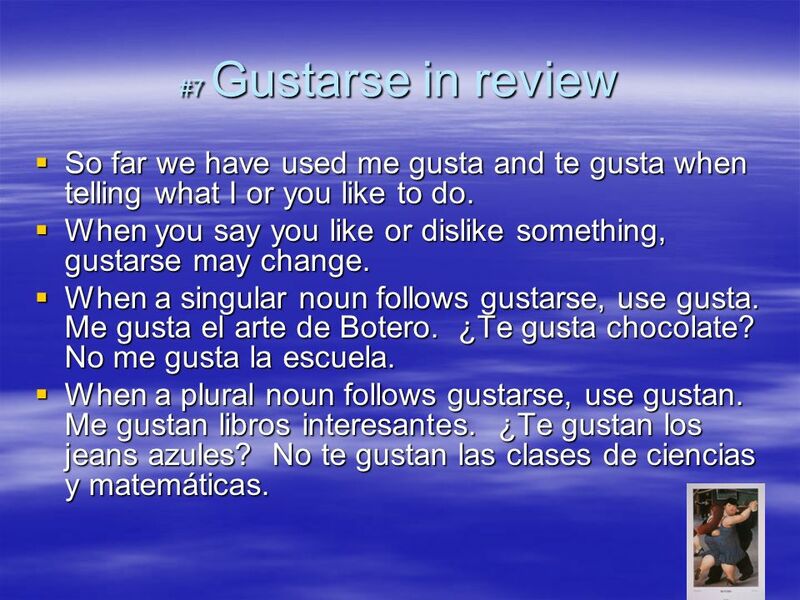 #7 Gustarse in review So far we have used me gusta and te gusta when telling what I or you like to do. When you say you like or dislike something, gustarse may change. 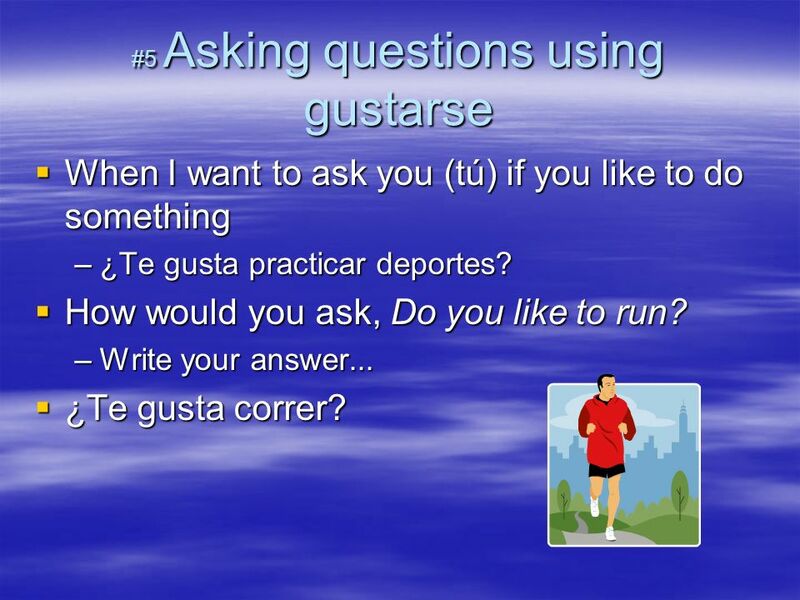 When a singular noun follows gustarse, use gusta. Me gusta el arte de Botero. ¿Te gusta chocolate? No me gusta la escuela. 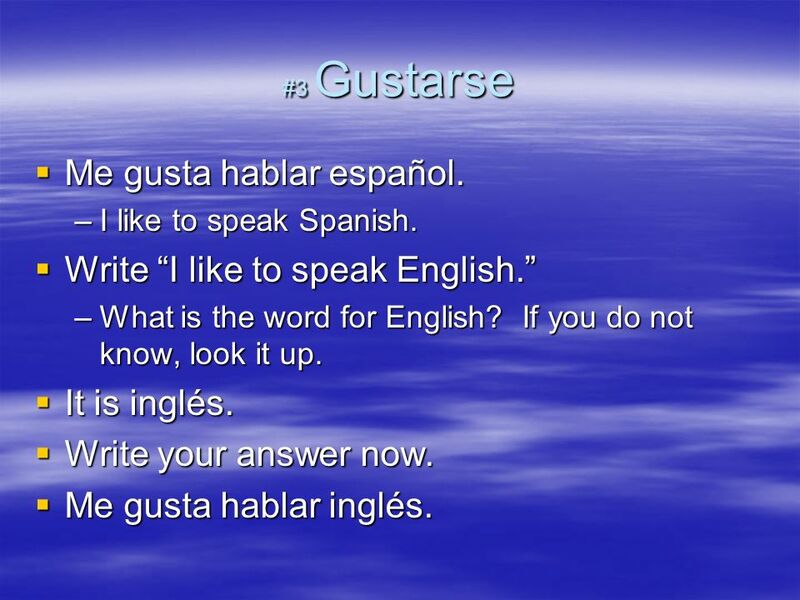 When a plural noun follows gustarse, use gustan. Me gustan libros interesantes. ¿Te gustan los jeans azules? No te gustan las clases de ciencias y matemáticas. Translate these sentences: 1. I like to read magazines. 2. You like to play videogames. 3. I like hamburgers with French fries. 4. You like bananas. 9 2. Te gusta jugar videojuegos. #9 Check your answers: 1. Me gusta leer revistas. 2. Te gusta jugar videojuegos. 3. Me gustan hamburguesas con papas fritas. 4. Te gustan plátanos. 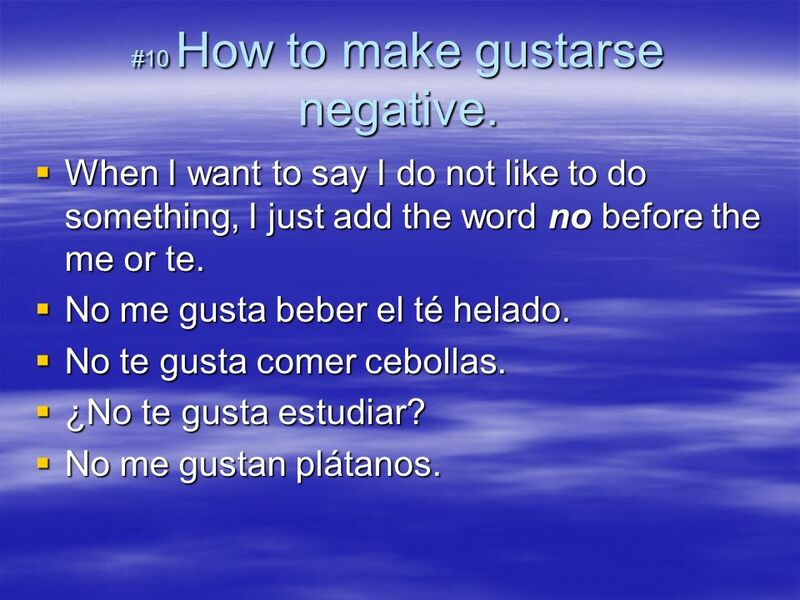 10 #10 How to make gustarse negative. When I want to say I do not like to do something, I just add the word no before the me or te. No me gusta beber el té helado. No te gusta comer cebollas. ¿No te gusta estudiar? No me gustan plátanos. 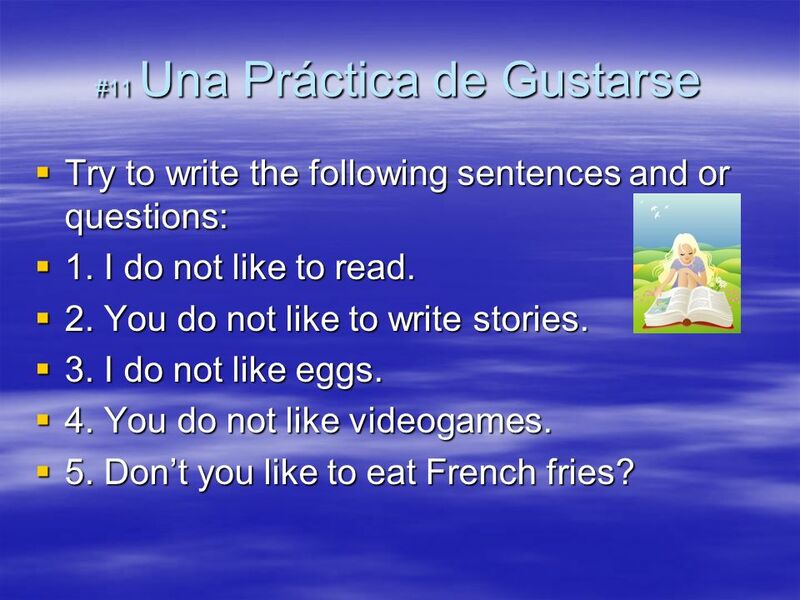 Try to write the following sentences and or questions: 1. I do not like to read. 2. You do not like to write stories. 3. I do not like eggs. 4. You do not like videogames. 5. Don’t you like to eat French fries? 12 2. No te gusta escribir cuentos. 3. No me gustan huevos. #12 Check your answer: 1. No me gusta leer. 2. No te gusta escribir cuentos. 3. No me gustan huevos. 4. No te gustan videojuegos 5. ¿No te gusta comer papas fritas? 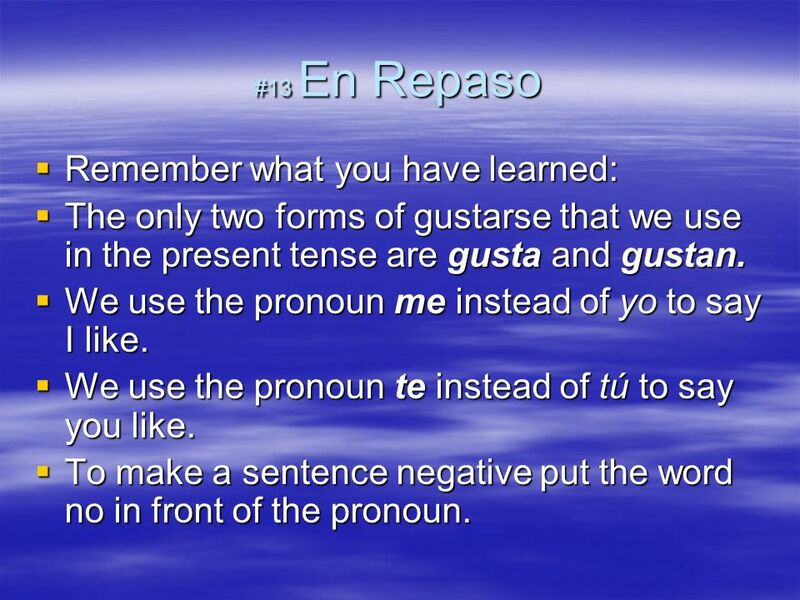 #13 En Repaso Remember what you have learned: The only two forms of gustarse that we use in the present tense are gusta and gustan. We use the pronoun me instead of yo to say I like. 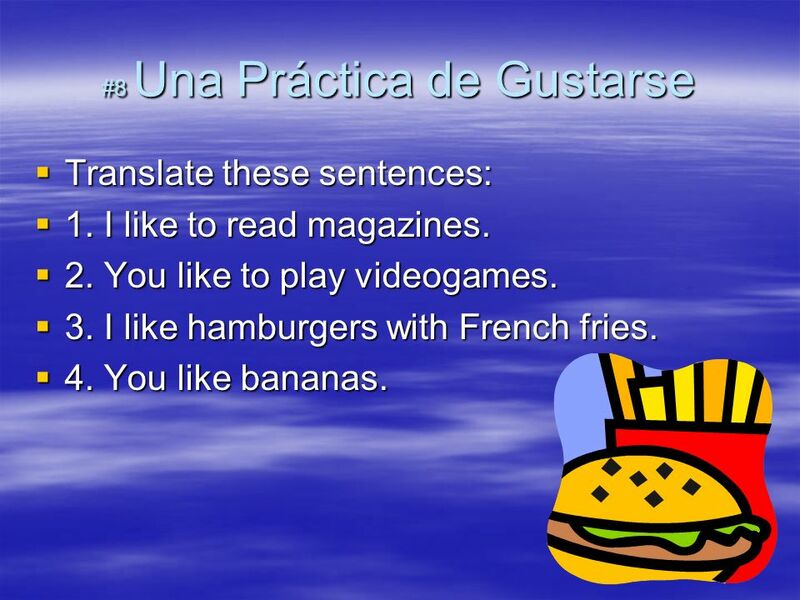 We use the pronoun te instead of tú to say you like. To make a sentence negative put the word no in front of the pronoun. 14 Do the independent practice on your answer sheet. 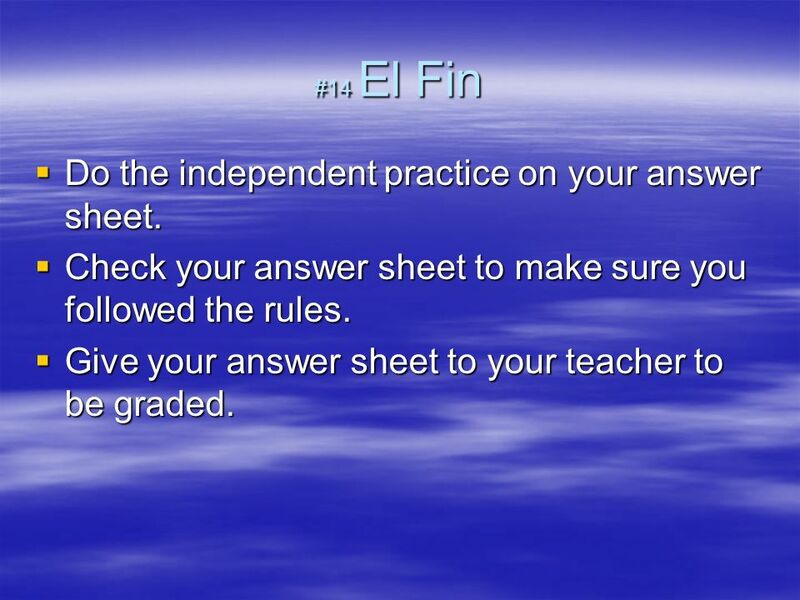 #14 El Fin Do the independent practice on your answer sheet. Check your answer sheet to make sure you followed the rules. Give your answer sheet to your teacher to be graded. 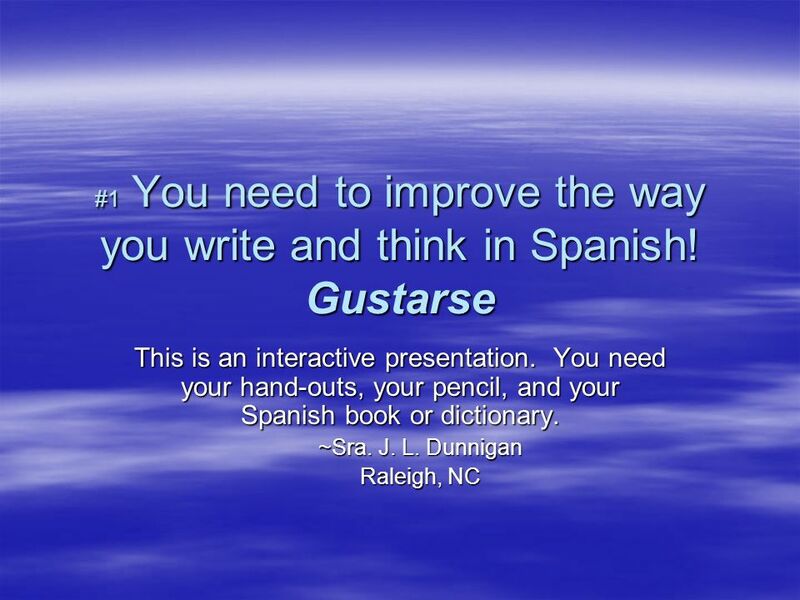 Descargar ppt "This is an interactive presentation"
You Need to Improve the Way You Write and Think in Spanish! Months & Dates This is an interactive presentation. You need your worksheet, your pencil, and. 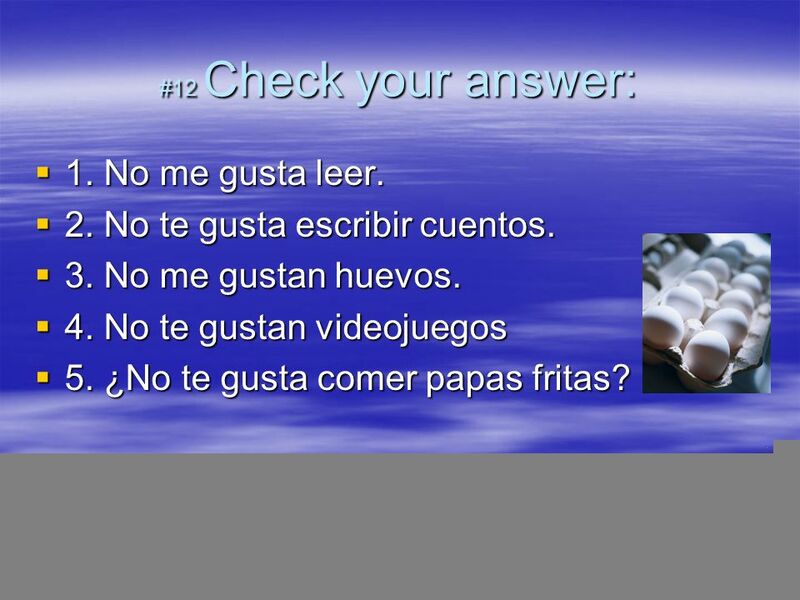 Subject Pronouns and AR verb conjugations As you click through this powerpoint, you will need to answer the questions on your worksheet. At the end, you.